"Hi, I'm an iPhone user and wish to know other ways to backup iPhone than iTunes or iCloud. Any advice! Please let me know!" 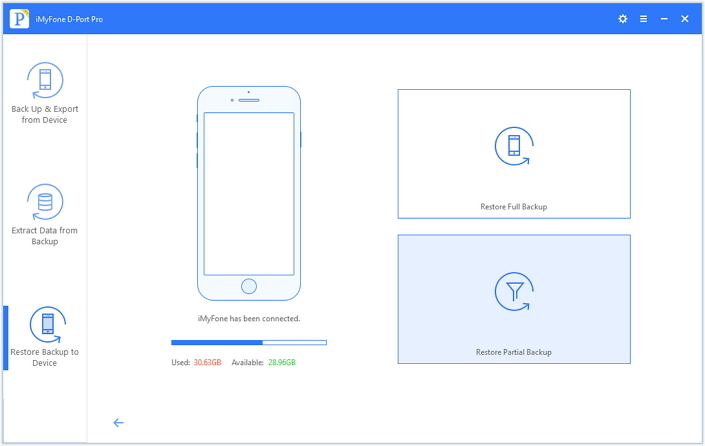 We have received similar questions from many iOS device users and we are here to introduce you a third party iPhone backup software which will help you and clear out your confusion. Actually there are few choices in the marker, but we are going to let you know about the most excellent 3rd party iPhone backup tool. As the heading goes, iMyFone D-Port Pro is believed to be the best 3rd party iPhone backup software which comes with a great deal of facilities and quality. This is an amazing 'backup and restore' tool which allows you to backup and restore selectively. It can be considered as the best iTunes alternative to use for backing up and restoring the contents in the iOS device. What's more, the backing up feature is totally free. All iOS versions and iOS devices are supported. It is a flexible backup tool. 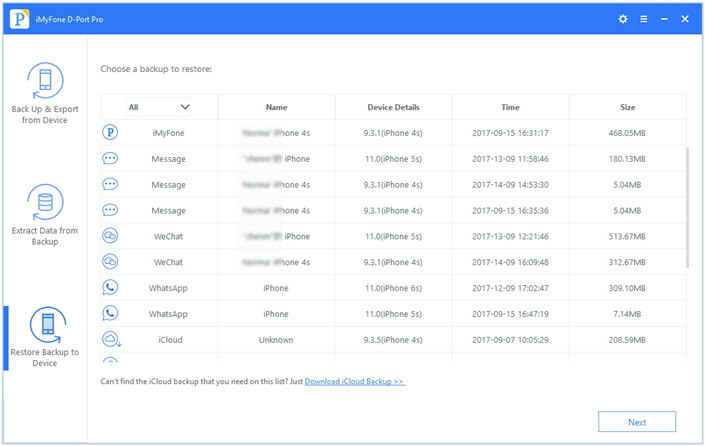 You can use it to make a full backup, or separately backup WeChat, WhatsApp or messages and more will be supported in the next version. One can use it without the fear of previous backup being overwritten, unlike iTunes which replaces the old backup with the new backup. You can view and extract 20+ types data from the backup files without restoring the backup to your device. You can also selectively restore data from your iTunes, iCloud or iMyFone backup with this tool without affecting the other data on your device. 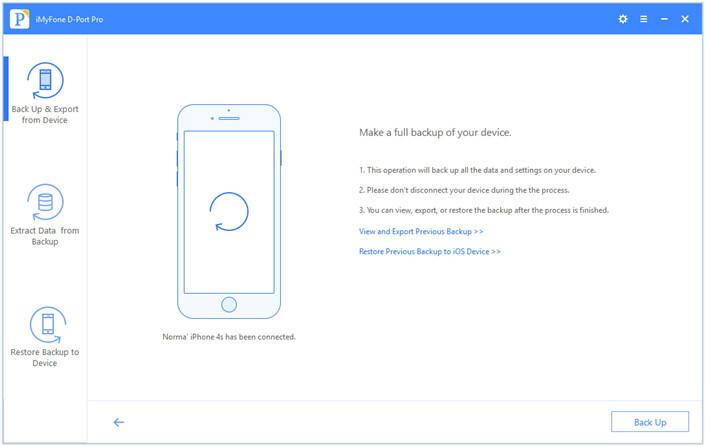 Following are the steps guides on how you can use this 3rd party iPhone backup and restore tool. 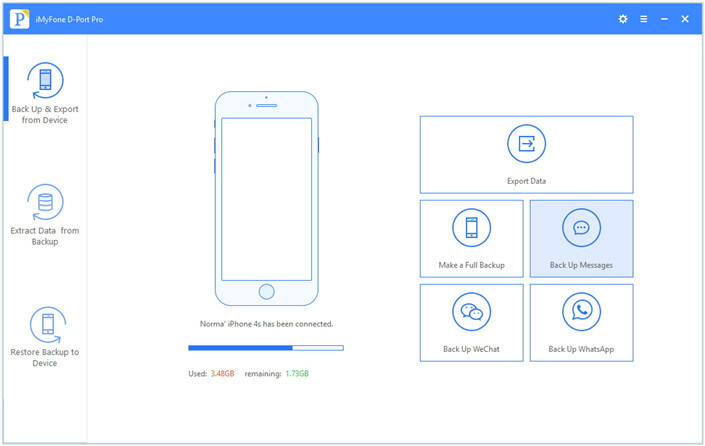 Firstly, this tool can help you in making a full backup of your iPhone or other iOS devices. 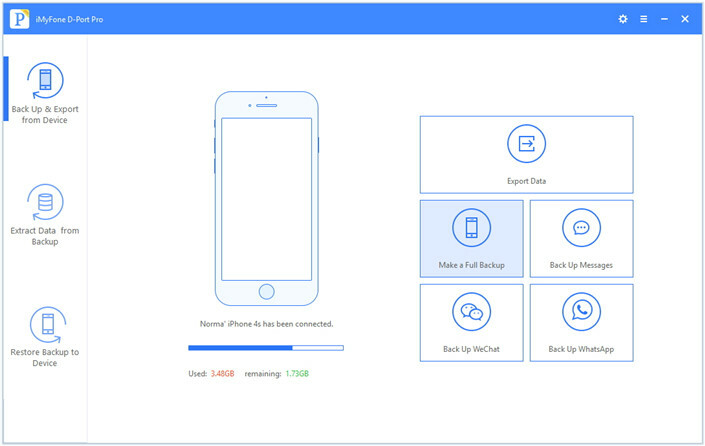 We will initially learn how you can make a full backup of your data with this third party iPhone backup software for free. Yes, this is completely free function to use. Here are the steps. Step 1 – Launch the program in your PC and go to "Back Up & Export from Device" on the main screen. After this, hit on the "Make a Full Backup" option on the right side. Step 2 – Enter to the next screen and click on "Back Up" option for continuing. Your backup process will then start and this is advisable not to disconnect your device during the whole process. Step 3 – Wait for the process to get complete. Once it gets complete, you will get notification for this. See, how easy the steps were! As we mentioned earlier, this iPhone backup 3rd party program assists in making backup of the data separately. This is what we are going to show in this section. This function can also be enjoyed for free as well. Learn the steps below for backing up messages on your iPhone deparately. More types of data will be added in the next version. Step 1 – Connect your iPhone to the computer and open the program in your PC. On the main interface, click on "Back Up & Export from Device" option appearing on the left panel. Now, at the right side hit on "Backup Messages" option. Step 2 – In the next step, go to "Back Up" option. Click it and start the process of backup. Step 3 – Do not detach your device for the whole process. You will receive a notification at the time when the process will come to an end. Note: The other types of files can also be backed up this way. Only the corresponding tabs need to be clicked. This tool is not just an iPhone backup software but also helps in selectively restoration. 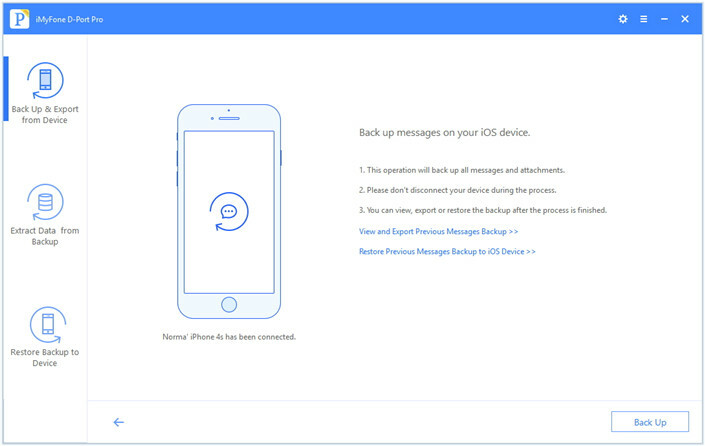 We are going to show the steps on how to restore messages from iMyFone backup to your iPhone. Before starting, connect your device to the computer. 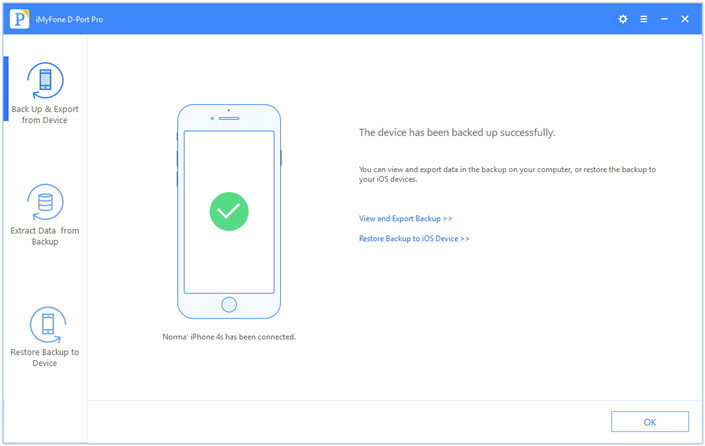 Step 1 – Launch iMyFone D-Port Pro and you will receive a list of backups you have made. Choose iMyFone from the list and then click on "Next". Step 2 – Now, click on "Restore Partial Backup" from the next screen. Then you will be asked to choose the data type that you want to restore. 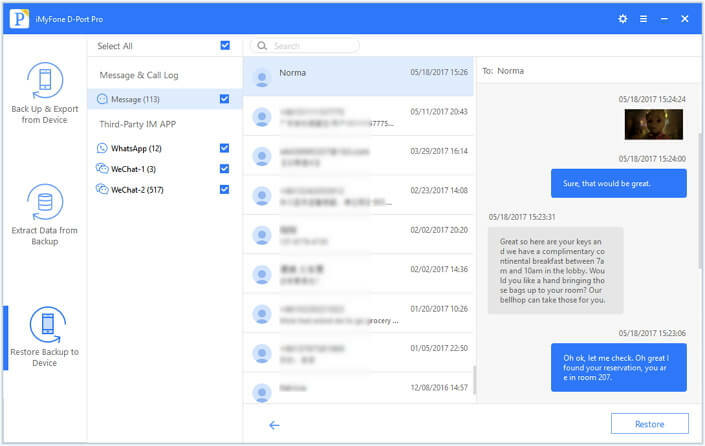 Check "Messages" and within a few seconds, you will be able to see your messages on the screen. 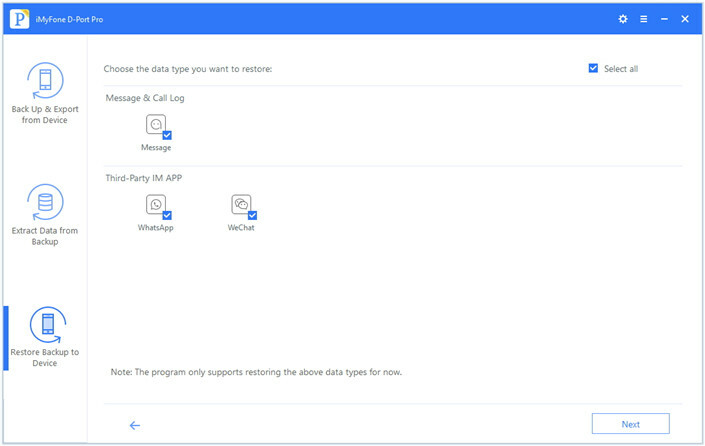 Step 3 – Lastly, confirm the messages are what you want to restore and click on "Restore" button to get your messages to your iPhone without overwriting the other data. Here are the final words and we are really glad to share to you the other way to backup and restore iPhone and other iOS devices. We hope that you are fully understand the capability of this iPhone backup software which probably you never knew about earlier. We expect that you agree that iMyFone D-Port Pro is a helpful and easy-to-use third party iPhone backup software. Please let us know if this article really helped you.